Rapid urbanization of economic zones in China has resulted in a special social phenomenon: "villages-in-the-city". Underdeveloped villages are absorbed during the expansion of urban areas, while retaining their rustic characteristics. Due to the rural characteristics of these areas, social security is much lower compared with the urbanized city. 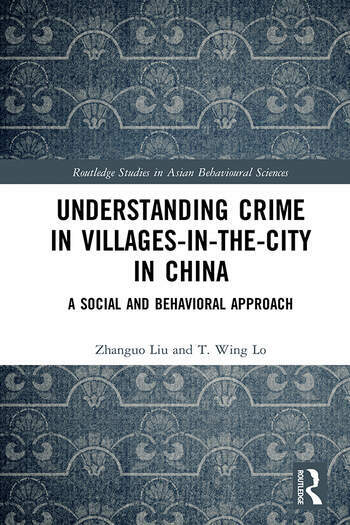 This book uses Tang Village, a remote area in the Shenzhen Special Economic Zone, as an example to establish a comprehensive analytical framework by integrating existing crime theories in analysing villages-in-the-city. The analysis covers the community, individual and macro-level to detail the diverse social and behavioural factors causing crime at multiple levels. First, a brief history of the urbanization process of Tang Village is provided to establish how urban planning contributed to the issues in the village today. The authors go on to explain how socially disorganized communities dictate the crime hotspots and the common types of crime. The book examines other risk factors that may contribute to the level of crime such as weak social controls; building density and floating populations of poor working class migrants. The routine activities of victims, offenders, and guardians are examined. The book concludes with the current trends in the social structure within the villages-in-the-city and their expected outcome after urbanization. Zhanguo Liu is the founding Director of Leaguer Industry Research based in Shenzhen and conducts research projects for industry and business. He graduated from the Xi’An University of Architecture and Technology, Peking University, and City University of Hong Kong. Before beginning his work in product research, Dr. Liu worked as a post-doctoral researcher in the Joint Social Science Program at the Shenzhen Research Center of Peking University and the Hong Kong University of Science and Technology. T. Wing Lo is Head and Professor of the Department of Social and Behavioural Sciences at City University of Hong Kong. He received his PhD in criminology from the University of Cambridge (1991). Before joining academia, he worked with triad gangsters on street corners for 17 years. He had been invited to address the UN delegates attending the Palermo Convention Against Transnational Organized Crime (2010), and officials of the US Department of Defense (2015). He is Founding Editor of the Routledge Studies in Asian Behavioral Sciences, member of the International Advisory Board/Editorial Board of the British Journal of Criminology, Youth Justice, Asian Journal of Criminology, British Journal of Community Justice, and so on. His research interests are triad society, anti-corruption, and offender rehabilitation. He has authored or edited several books, such as Corruption and Politics in Hong Kong and China (1993); Fighting Youth Crime: Success and Failure of Two Little Dragons (2002, 2004); Understanding Criminal Justice in Hong Kong (2008, 2017); Organized Crime and Corruption Across Borders: Exploring the Belt and Road Initiative (2019).